Marcus and I had a date night on Wednesday. We've been going out very infrequently during the week, ever since we moved into our apartment this summer, so Marcus thought it'd be a fun idea to change up our pace this week! To be honest, it caught me a little off guard, mainly because I've been in the habit of cooking dinner for us every night during the week (yay for having our own kitchen! ), but in this case, I was up for the "spontaneity" here. We were trying to decide where to go, going through our mental lists of eventual spots that we wanted to hit up in the city. A Tex-Mex joint near 34th Street and a popular steakhouse were initial ideas, but poor reviews and lack of reservations, respectively, precluded us from committing to those restaurants for dinner. 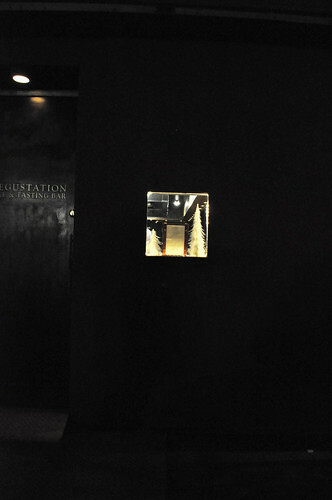 Then, I immediately thought of Degustation, an unconventional tapas bar that Alice and Jimmy frequent quite a bit. They both always have great things to say about it, so I figured this was a better time to go than any. Marcus was down for that, so we met at the restaurant around 6:30. I couldn't make any reservations because the restaurant doesn't open until 6, but being that it was a Monday night, seats shouldn't be too difficult to come by. Right in the heart of the East Village, Degustation is tucked away behind a dark restaurant-front with a petitely square window into which sidewalk passersby can't help but peer with curiosity and wonder. It is seemingly like a black box, holding away a very well-kept secret, and the only way you'll be "in the know" is if you take the plunge of going inside. There was a dinner guest sitting near us at the JBF LTD dinner we attended earlier this year (with Chef Laurent Gras as the featured chef) who was raving about this amazing restaurant in the East Village, remaining all "hush-hush" about telling the individuals at our table (which included a couple chefs, Marcus, and myself) any more than he already had. It was almost like pulling teeth to have him divulge the name -- he made it seem like we had this huge responsibility of keeping it quiet so that the place would still remain under the radar from throngs of namedropping foodies. He treated the information here as incredibly privileged, almost as if he were some double-agent spy revealing his identity. We concluded if this place was worth all this fuss of keeping it on the down-low, then it was definitely worth checking out. 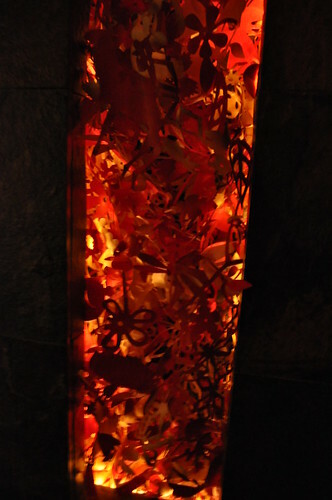 Some paper decorations inside Degustation. The restaurant seats about 20 or so guests along the bar counter, so a very intimate (and limited) atmosphere. 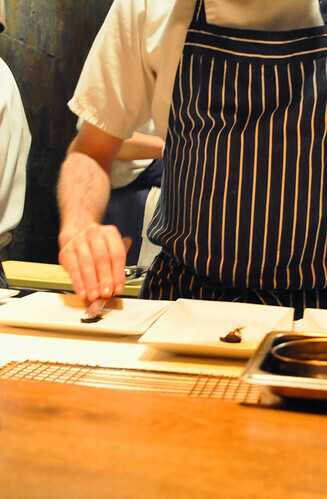 As you're enjoying your series of small plates, you can observe the chefs prepare and plate the small plate orders. 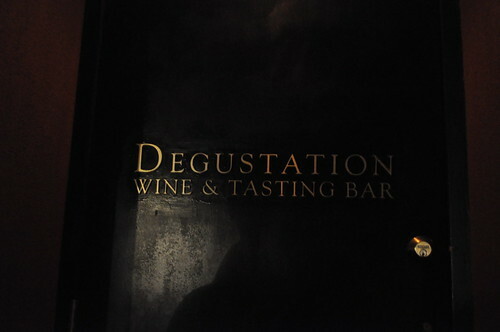 I think the name of the restaurant, Degustation, is so very fitting for its cuisine, nature, and atmosphere. To degust is "to taste or savor carefully or appreciatively," so the act of doing so is "tasting, especially as a form of careful appreciation." It's so fascinating to say so much with one "measly" word. The menu of small plates. Once we selected our six small plates to share (portion recommended by our waiter), we proceeded to staring intensely at the chef's techniques at plating our very first small plate. 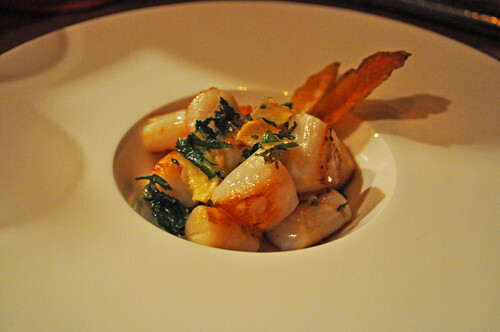 First up were the Nantucket sea scallops seared in duck fat served with chili, potato, and parsley chips. The scallops had a really great flavor from being seared in duck fat. The lightly scorched edges gave them a nice contrast to the interior texture, which boasted an ideal, balanced temperature (not slimy from being undercooked, not tough from being overcooked) at which to be eaten. The crunch of the potato chips and parsley chips were fitting additions as well. Our second small plate was the snapper with parsley and puerro salda (a leek soup/purée). The snapper's skin was crispy and had a nice toasted flavor, balanced out with the soft texture of the snapper's flesh. 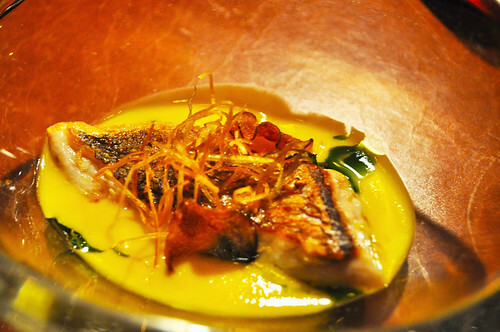 The yellow sauce (i.e., the puerro salda) was very flavorful -- creamy yet light, complementing the snapper very well. 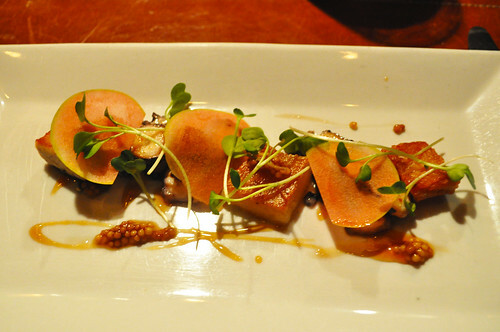 Next was the braised octopus with crispy pork belly, grapefruit, micro-wasabi, and mustard seeds. The octopus slices were hidden under the thin slices of grapefruit. Overall, the octopus was braised well, emitting flavors brought out by the mustard seeds and micro-wasabi. Its exterior had a scorched bits, giving the otherwise The crispy pork belly included the crunchy, roasted skin -- very reminiscent to me of Chinese-style roast pig -- which got most of its favor from the thick and fatty underlining of the crisp skin. 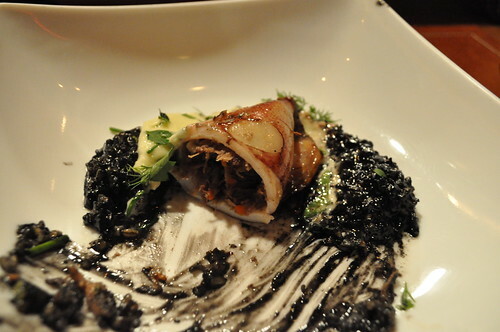 Our fourth small plate was the oxtail-stuffed squid with with squid ink steel-cut oatmeal risotto and garlic aioli. By far our favorite small plate, the squid was warm and firmly chewy, bursting with the heartiness of the savory oxtail stuffed in its hollow interior. The garlic aioli blended all of the flavors together with the unifying power of garlic and mayonnaise. 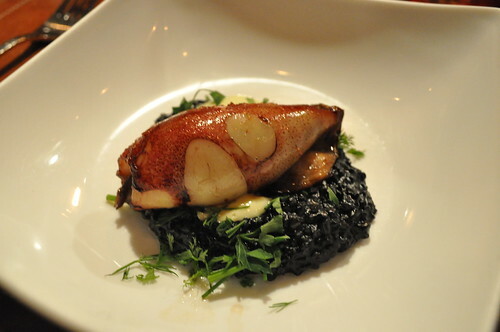 To top all of this, the risotto was very rich with a slight vinegary and salty overtone from the absorbed squid ink in the grains of oatmeal/rice. With a stickier consistency than traditional risotto, it complemented the flavors and textures of the oxtail-stuffed squid in ways I couldn't imagine until upon having a bite. View of the oxtail, stuffed inside the squid. 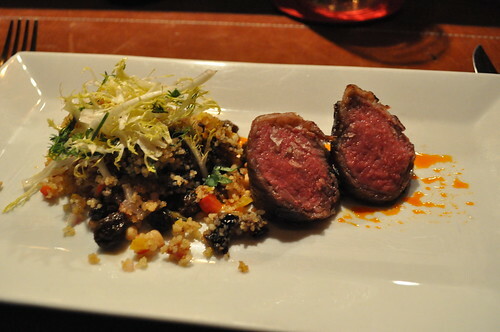 Following the squid was the duo of lamb wrapped in lamb bacon with prune couscous, pine nuts, and pickled raisins. The lamb had a really nice pink center for a lovely medium rare preparation. The lamb bacon surrounding the duo's circumference gave it a crispy exterior, adding to the already-hearty flavors of the lamb meat. The couscous gave the dish a Mediterranean undertone with its texture, tanginess (from the prunes and pickled raisins), and exotic spicefulness. To top it off, the pine nuts gave a overlaying toasted taste to the couscous, making it even more palatable. 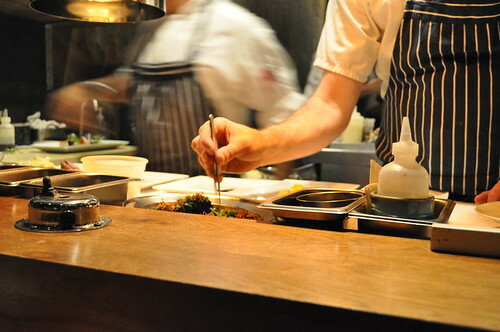 During the course of our meal, whilst nomming away at and in between our small plates, we were admiringly watching the chefs in the counter kitchen at Degustation plate orders with both amazing speed and intense precision. Look at those surgically looking tweezers! It's how everything looks impeccable on the plate. 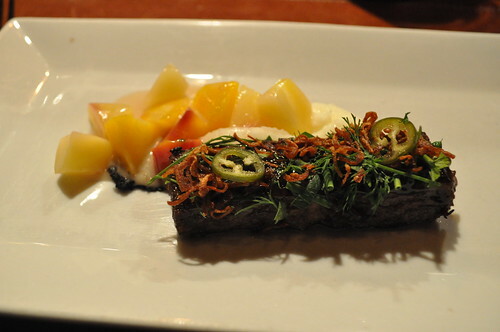 For our last small plate, we shared the braised short ribs with cassis, pomme purée, and carrots. The short rib meat seemed pieced apart already, only to be shaped back into a nicely formed, solid terrine. The end result was tenderly braised short rib meat topped with herbs, a crunch, and peppers -- flavors and textures blending very well. The accompanying pomme purée were like delightfully whipped clouds -- creamy and nicely peaked. The carrots had a great crunch with an added savory dimension, which I assumed to be a result of its preparation -- perhaps sous vide or in protein fat, siding well with the pomme purée. What I liked most about this dish was that it still maintained the heartiness of a traditional braised shortrib dish, but was not overwhelming in size, which would normally cause a sensation that you may have eaten too much. Findings: So date night at Degustation turned out to be quite fun and delicious! 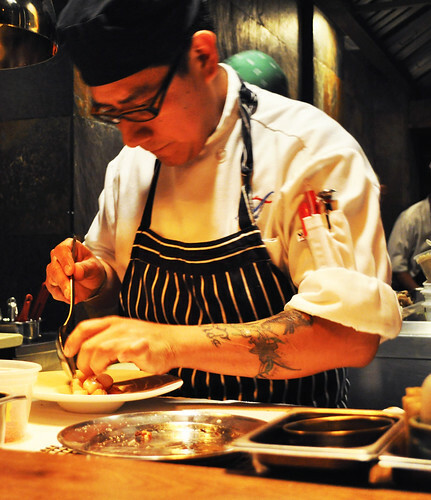 We thought the restaurant's repertoire of small plates was both fascinating and unique in terms of ingredients and preparation styles. Every bite I took from all of our small plate selections were filled with explosions of many flavor and textures. The portions were mostly appropriately sized -- it definitely left me wanting more after every last bite, in the same way of that I recall The French Laundry hopes its guests say, after every course, "I wish I had one more bite of that." 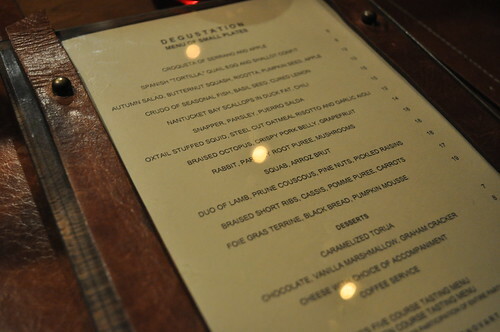 The counter-seating at Degustation is another relished part of the dining experience. It allows you to gape at the chefs plate each dish efficiently and beautifully for the restaurant's patrons to admire and enjoy. It is evidence of the chefs, hard at work, with the wall, typically separating kitchen and dining room, now non-existent. It is no longer a hidden show behind those heavily swinging doors, but rather like a performance -- a series of vignettes upon smaller dining plates, perfect for the tapas theme of Degustation. 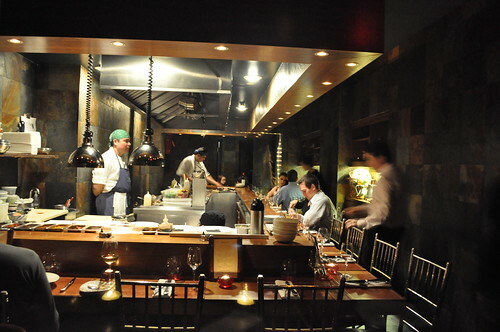 The intimate, cozy nature of the restaurant is definitely great for dates (and date nights!) and for taking your foodie friends that are visiting from out-of-town. The low-decibel ambiance -- soft background music subtly interjected with the general counter kitchen clatter -- makes conversation effortless and easy, with no need to holler at each other over loud crowds and even louder club music of the usual tapas/wine bar spots. Thanks to Alice and Jimmy for the great recommendation to what seems to be almost a tucked away secret in the East Village! Looking forward to returning here for a future meal or two -- I'm still drooling over the oxtail-stuffed squid and squid ink risotto! Price point: $12-18 for each small plate.